Round Eye Supply has helped pizza joints deliver thousands of pizzas over the years with our affordable pizza boxes. 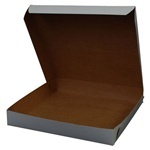 We are the restaurant supply leader in the United States and carry the best quality pizza boxes. Our best brands of Pizza Boxes are Southern Champion and Honeymoon Paper. Honeymoon offers you choices for all your tough pizza packaging needs. Quality pizza boxes can make the difference between a good pizza and a bad one. Pizza Primo Box - 12 in. Pizza Primo Box - 7 in. Corrugated Pizza Boxes B Stock Print White and Red - 16 in. x 16 in. x 1.75 in. Corrugated Stock Print B Flute Pizza Box - 12 in. x 12 in. x 1.75 in. Corrugated Pizza Boxes Stock Print B-Flute White - 14 in. x 14 in. Pizza Primo Box - 16 in. Corrugated Pizza Boxes B Stock Print White and Red - 10 in. x 10 in. x 1.75 in. Window Pizza Box - 7 in. White Pizza Boxes Claycoated - 9 in. x 9 in. x 1.5 in. Plain White Pizza Boxes - 14 in. x 14 in. x 1.88 in. Plain White Pizza Boxes Lock Corner - 10 in. x 10 in. x 1.5 in. Redbrick Corrugated B-Flute Pizza Box - 10 in. Redbrick White and Kraft Corrugated B-Flute Pizza Box - 12 in. Redbrick White and Kraft Corrugated B-Flute Pizza Box - 14 in. Redbrick White and Kraft Corrugated B-Flute Pizza Box - 16 in. Kraft Wrapped Plain B-Flute Pizza Box - 10 in. Redbrick Kraft Corrugated B-Flute Pizza Box - 10 in. Redbrick Kraft Corrugated B-Flute Pizza Box - 12 in. Redbrick Kraft Corrugated B-Flute Pizza Box - 14 in. Redbrick Kraft Corrugated B-Flute Pizza Box - 16 in. We have been selling Pizza Boxes for 40 years. We know how to take care of your restaurant supply needs and strive for perfect service.